We could already see this trend coming a couple of seasons ago, but this spring/summer 2008, the wide leg, high waisted pants are going to be BIG! From demins, to really light fabrics like linen, wide leg pants are the way to go. Try wearing them with tight tank tops so you balance the volume and don’t look like you are big all over the place. They are great when it comes to hide problem areas like big hips, and they will make your legs look super long, specially if they are high waisted. 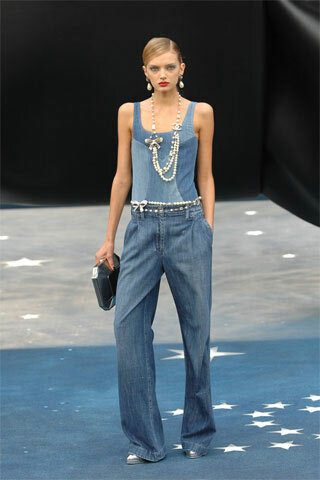 Here are some examples from CHANEL, DKNY and Mary- Kate Olsen of how to wear them. Don’t wait, go get your wide leg pants and good luck rocking them this spring!